A couple years on from the release of Eric Chenaux's last full-length release, 2012's Guitar and Voice, the experimental balladeer has announced his next project for Constellation Records. Dubbed Skullsplitter, Chenaux's latest solo record for the label lands February 17. 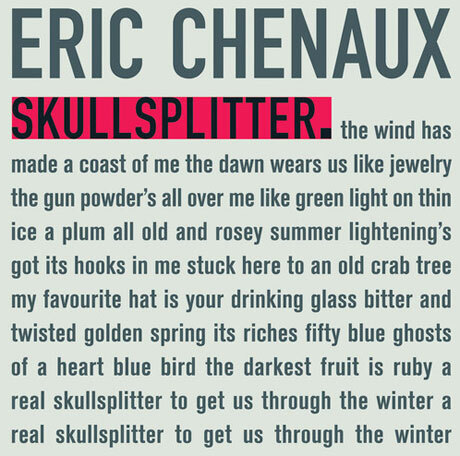 A press release for the nine-song platter notes that Chenaux once again worked in the studio with recording engineer Radwan Ghazi Moumneh to produce Skullsplitter, which blends the "genuine, natural, unaffected vocals" of the artist with experimental recording techniques. To obtain some of the guitar sounds on the LP, the pair employed the use of "physically swinging speakers and radical gating and panning to tease out further fluctuations in the barometer of the guitar sound." Though featuring several new compositions, "Have I Lost My Eyes?" from 2008's Sloppy Ground has been refurbished for the new disc. The title track, meanwhile, is a more intimate reworking of the full-band version that appeared on his 2006 LP, Dull Lights. You'll find the updated composition down below, along with Skullsplitter's tracklisting. 1. Have I Lost My Eyes?